Why are we considering purchasing permanent property for Graystone Walton? A portable setting is not a permanent solution for any church. Since the planning stages of Graystone Walton, the leadership was clear that the goal was to eventually move the church into a permanent location. Weekly set up and tear down eventually becomes a drain on the volunteers, morale, and energy level of a church. Research also indicates that moving to a permanent facility increases a multi-site campus’s ability to reach more people. We have also investigated several buildings that could be rented. However, we would have to invest a large amount of money in order to make the building suitable for worship for a church the size of Walton, and most of the improvements would have to be left with the building when we moved out. Why are we purchasing property now instead of a few years from now? Our vision is to start more campuses. However, we feel it is important that we not have multiple campuses in portable settings as we begin to carry out this vision. Second, the land and buildings are available now. This opportunity has presented itself and we believe we should pursue it. It is a great piece of property, in a great location, for a great price. Why are we renovating an existing facility verses buying a tract of land and building from scratch? Again, this property is in a great location and already has the infrastructure in place. It is so much more cost effective to renovate an existing structure than to build from the ground up. This 5 acre piece of property has a large portion already cleared and leveled. It has around 2 acres of paved parking, 2 entrances, over 20,000 square feet of buildings, and parking lot lighting. It is actually more space than we need right now, but gives us room to grow in the future. Buying an existing structure puts us years ahead of what it would take to buy land and build from the ground up. Why are we purchasing property in Monroe? First, the site puts Graystone Walton in the geographical center of Walton County, which seems appropriate given our name and focus. Second, we have sensed over the past year, and it has been confirmed by multi-site pastors that we have contacted, that Graystone Walton is too close to the Ozora campus. As a result, our ministry focuses have a huge amount of overlap. Whether it’s mailers or community involvement or campus identity, being ten minutes apart is a challenge for the long term stability of Graystone Walton. As a result, we don’t think it wise to look for a permanent facility west of the high school. We also believe that Highway 81 is sufficiently covered by churches. That leaves 78 east as our best alternative for a permanent site that moves us farther away from the Ozora campus. This location increases the ministry area of Graystone Walton and Graystone Church and decreases the amount of overlap. 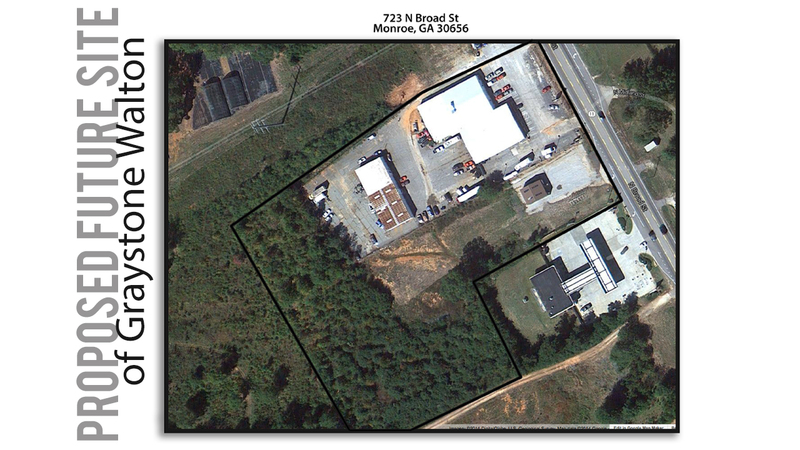 Also, the property in Monroe is on Highway 11 and right off of Highway 78. It is easily accessible from Bethlehem, Social Circle, Loganville, and even the Oconee County area. Isn’t Monroe a different demographic than Loganville and couldn’t that create a problem? First, we are not becoming Graystone Monroe. We are Graystone Walton and will continue to minister to Loganville as we add ministry to Monroe. Almost any move would result in some change in the community and demographics surrounding the church. There will certainly be new opportunities for ministry in Monroe. However, we also believe the new developments that are coming north of 78 would put us in the middle of growth and expansion giving us greater opportunities for impacting people for Christ. Are there already budgeted resources currently being used for rental agreements that can be used to make the payment on the new loan? Yes. We currently pay around $3000/month for the rental of the high school on Sundays plus the custodial fee. When we have activities that extend into the afternoon or evening, such as the Fall Festival and the upcoming Easter egg hunt, we pay an additional hourly rate for the custodian who must be present whenever we have activities. In addition, we also rent facilities for some of our ministry activities. We recently rented a room at Meridian Park for a volunteer training and we rent the Bay Creek Community House for weekly children’s small groups. The annual budget allows for $2000/month for these additional rental expenses. So, there is already $5,000/month in the 2014 budget designated for Graystone Walton facilities. Are there other activities that are currently being housed in off campus settings? Currently our youth small groups meet at Night Owlz Frozen Yogurt in a small room in the back. While it serves our purposes now, the youth ministry will eventually outgrow that space. The youth also have a monthly worship service at the Christian Learning Center at Loganville High School. In order to truly grow the youth ministry, this worship service needs to expand to a weekly event. While Night Owlz and the CLC have been very gracious to allow us to meet for no charge, we likely would not be able to meet for a weekly worship service at the CLC, which limits our ability to grow the youth ministry. 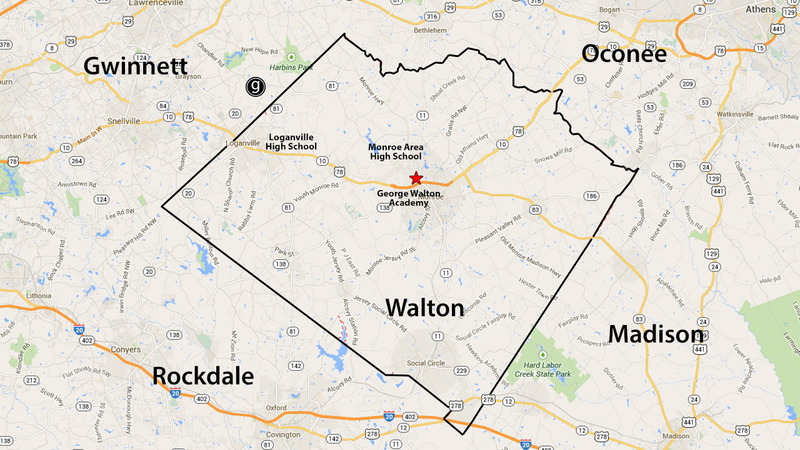 Will Graystone Walton lose members who live in Loganville when the church moves to Monroe? The new location is only 10 minutes from Loganville High School, and we are praying that everyone who currently attends Walton will be willing to drive a little farther if necessary to be a part of what God is doing at Graystone Walton. Obviously, for some of the Walton people, the campus will be closer to where they live. However, anytime a church relocates there is a risk that some people will not move with the church. Fortunately, because the campuses are currently so close, there is the option of attending the Ozora campus for those who live closer to that campus. How will we pay for the new building? The goal is to maximize the shared benefits of a multi-site strategy while at the same time giving Graystone Walton the opportunity to have ownership in making this move a reality. We also believe it is important for Graystone Walton to have their own opportunities to step out in faith. We believe all of these goals are accomplished in our proposal. The cost of the property is $750,000. Graystone (the combined budgets of both campuses) will borrow the $750,000 needed to purchase the property. In addition, Graystone will borrow $250,000 as a construction loan to begin renovating the property. Graystone Walton will be responsible for raising the remaining $250,000 that will be necessary to complete the renovations necessary in Phase 1 to actually move into the building. The $250,000 will be raised through a capital campaign at Graystone Walton. 10. What is the time frame for moving into the building? I think this is great! I hope there will be a chance for Graystone Walton to do some of the work…to be a part of the process.